Metanoia - Viktória G Duda, Ph.D. 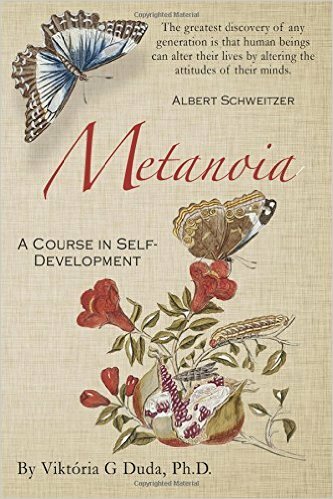 This is the (non-fiction) book accompanying the self-development course: "Metanoia." There is one subject they didn't teach you in school, but should have: self-development. You have learnt history, but they haven't explained why as a race we always wage wars. You have learnt biology, but no one has asked where our evolution is heading. You have learnt geography, but they haven't taught you how to navigate inner landscapes. Yet, it is from within the depths of the psyche that our life is ultimately governed. Our beliefs, thoughts and sentiments run like programs governing our every action, our habits and ultimately our destiny. Metanoia is a self-development course, taking you on a fascinating journey into the realms of your own mind. It enables you to understand better your purpose in life and you will learn effective and fun techniques to fulfil it.